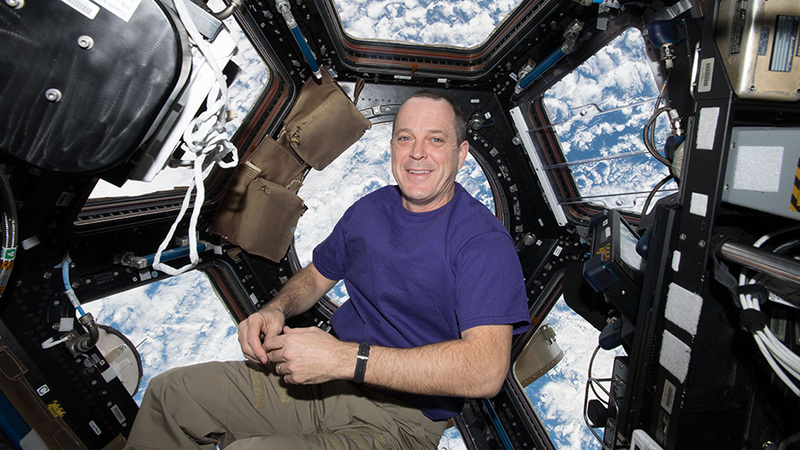 NASA astronaut and Expedition 55 Flight Engineer Ricky Arnold rests inside the seven-windowed cupola as the International Space Station orbits above the south Atlantic Ocean. The Falcon 9 rocket carrying the SpaceX Dragon cargo craft stands atop its launch pad counting down to a 4:30 p.m. EDT liftoff today to the International Space Station. The Expedition 55 crew is preparing for its arrival on Wednesday while continuing a variety of advanced space research aboard the orbital lab today. NASA’s Kennedy Space Center in Florida is hosting the 14th launch of a SpaceX commercial cargo mission to the space station. Astronauts Norishige Kanai and Scott Tingle are practicing the maneuvers and procedures necessary to capture Dragon with the Canadarm2 when it arrives at 7 a.m. Wednesday morning. Their fellow flight engineers Drew Feustel and Ricky Arnold joined them later in the afternoon to review the cargo they’ll transfer back and forth after they open the hatches to Dragon. Feustel spent the better part of his day testing algorithms on a pair of tiny internal satellites that could be used to detect spacecraft positions and velocities. Arnold strapped himself into an exercise cycle for an exertion in space study then collected his blood samples for stowage and later analysis. Expedition 55 Commander Anton Shkaplerov worked on a multitude of Russian maintenance tasks checking communications and life support gear. Shkaplerov also joined cosmonaut Oleg Artemyev for another exercise study, this time on the Russian side of the lab, exploring its effectiveness during long term space missions.